Just purchased a new Inception design 3-Way and installed it on my Autococker (old block with right-hand feed, might be a 1999 or 2000). Adjusted the LPR until it cycled correctly but not too much pressure. The firing and cycling settings a very close together, but function well. On the inception 3-way there is a little pilot hole next to the front barb (the one nearest the front block) and there is air leaking out of this hole. I believe it may have to do with where my actuator rod is set (using a hing frame). Should I be backing out the actuator rod (counter clockwise) or screwing it in further (clockwise)? Very much want to eliminate the leak. Otherwise the gun is firing well. Can't wait to put some paint through it! Welcome to our forums and thank you for being a customer. The dotted line on the image shows where the o-rings of the three way line up. With the hinge set up this means that your middle o-ring is too close to the center port with the white hose, so you would need to adjust the stem in slightly to help it seal before the port. Awesome! Thank you so much! This should be quick fix. I'll post my results soon! I adjusted the 3-way until it leaked from the block side, then I adjusted it until it leaked on the end. Then I set it in the middle (or at least as close I could get it). 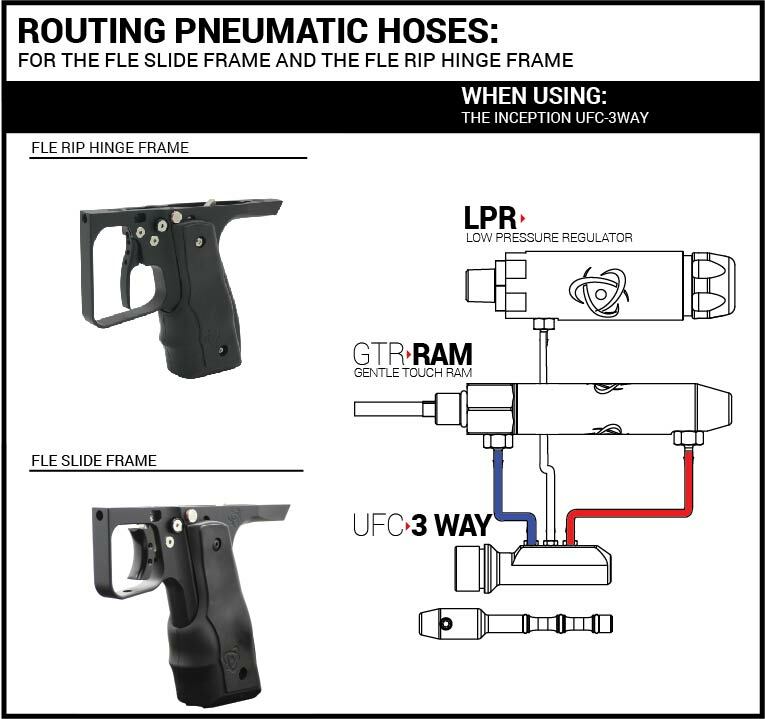 The leak is from the "pilot hole" just before the red line in Hinge the diagram. It's very small but detectable. I've read that this may have to do with the pressure from the LPR being too low. I ran out of air before I could test this but it's my next step to trying to cure the issue. Not sure how much I lose in air efficiency as a result of the leak. It's so small but I'd still like to cure it. Otherwise, the 3-way is great and cycles the gun like a champ. Last edited by ceradinimp; 03-23-2017 at 02:09 PM. I am not sure why you would adjust it until it leaks from one end, then the other, and set it in the middle? You just want to adjust it so it doesn't leak without pulling the trigger, cycles the gun when the trigger is pulled, and doesn't leak when the trigger is held. Setting it in the middle doesn't help performance (probably has an adverse affect). Setting it so it reliably doesn't leak when the trigger is at rest and then starts to switch as soon as the trigger is pulled is best. If you set the initial point correctly you shouldn't ever have to worry about the end point usually. You do need to have enough pressure to make the o-rings in the three way seal. In paintball we tend to run o-ring fits very lightly (at a point that most engineering handbooks would recommend against) so if you need a tighter fit to ensure a seal at lower pressure you can try using dow 55 on the o-rings to make them swell slightly and be tighter (works better at lower pressures). I was trying to time the autococker and wanted to know how far I could adjust before it started to leak. The firing and cocking mechanisms are right on top of each other. Makes for a fast trigger but I've read it may also cause some blow back and ball chopping (only using reball right now to test the marker). I think I have it in the right spot. Going to try increasing the pressure. Will also try the Dow55.